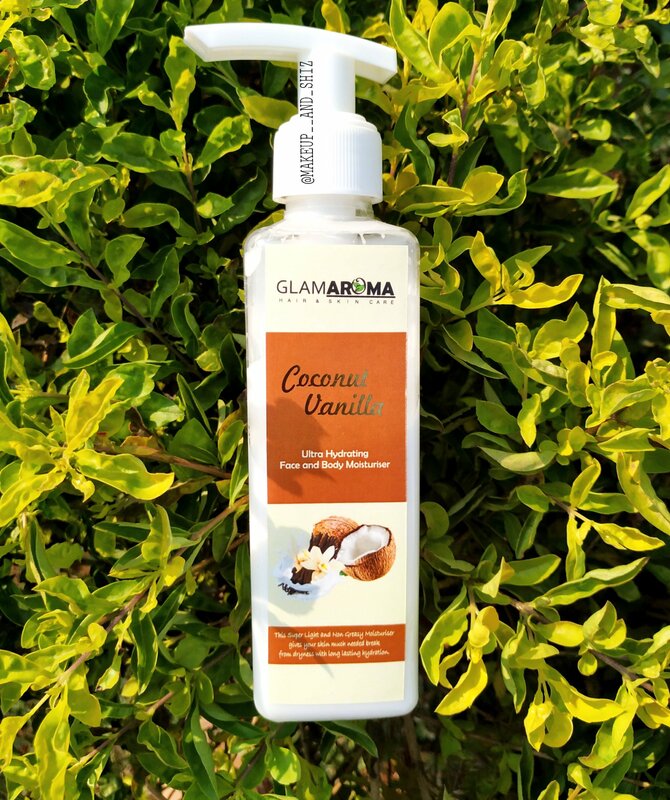 Glamaroma Beauty – Coconut Vanilla Ultra Hydrating Face and Body Moisturizer, Review. It is available on their website, for Rs 399 (200 ml ) and Rs 798 (400 ml). A non-greasy light weight formula that is super hydrating. The Vanilla helps treat and soothe the skin and mind due to the fragrance. While making the skin softer and supple while the coconut is already an excellent moisturising ingredient on its own ! •Can be used on Facial skin as well as on the Body. •Sinks Deep into the Skin and doesn’t leave a Tacky feel. •Doesn’t leave the skin oily. •Perfect Moisturiser to Prep the skin before makeup . It comes in a plastic transparent bottle. I love the packaging because you can actually see when you run out of the product and you know when to restock. The tube is very easy to use , doesn’t messes up or anything. Quite travel friendly too. Did it live up to all it claims ? Heck, yes ! It slides deep into your skin , super lightweight. It moisturized my skin , hydrated it without looking greasy or making it oil free. I didn’t wanna believe their claim that it would be hydrating , moisturizing and grease free & oil free as well. But it is! I think apart from the fact that it’s perfect for all skin type, even oily skin people have something to loop upto now . I have a dry skin and using it provided me with 12 hours of moisturization. Also didn’t break me out . I used it as my base makeup too. Yes. I would definitely recommend this to all skin type. Especially to people who struggle to find a grease free, oil free moisturizer. Suits body and face skin. Can be used for makeup. The pump stops working or creates a problem at times ! That was all for this post ! I hope you all like it. Have you tried anything from Glamaroma ? If yes, comment down and let me know ! Previous Garnier sheet mask — Review, India. Next Basic Skincare Routine for all skin types. Presently using normal coconut oil( Shalimar and Lion brand. I will trythe product you recommend.